Every NYEve we usually end up staying home, eating junk food, and playing games. This year we made plans with friends - dinner at our house followed by a show at the local comedy club. I decided on a Mexican feast. 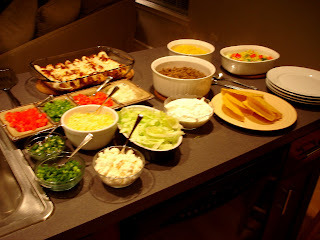 Here is the recipe for my enchiladas as well as for the homemade enchilada sauce that I like to use. I don't like to use those packages of seasoning for the meat. Instead, I use a mix of spices to give the meat some flavor. When the meat is browning, and after I have drained any excess fat, I add chili powder, cumin, onion powder, garlic powder, a touch of cayenne, and just a bit of salt. If you know me, you know that I don't measure any of them! I use the most chili powder and cumin, and the least cayenne and salt. I keep adding and adjusting until I have the right flavor. Once I do, I add about a 1/4 cup of water and let it simmer for 15 minutes or so to thicken up. I put out a variety of toppings for the tacos, including white onion, red pepper, green pepper, tomatoes, green onion, jalapenos, sour cream, a mix of shredded cheddar and Monterrey jack cheeses, and queso blanco fresh from the nearby Mexican market. I wanted something light and colorful for a veggie. I chopped 1 red pepper and 1 zucchini into chunks. In a large pan I heated olive oil then added the pepper, zucchini, and 1/2 of a bag of yellow corn. I seasoned it with some dried cilantro (fresh would have been great) and a touch of salt. The veggies only needed to cook for 6-8 minutes. I really liked this combination and will definitely make it again. I had my first margarita EVER at the Hilton Los Cabos when we were there last February. It was sooo good! I wish I knew exactly how they made it so I could duplicate it. 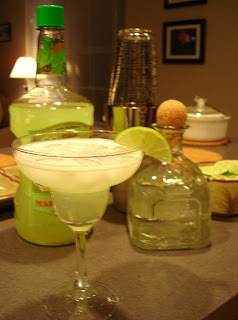 Ours were simply a margarita mix, Patron Tequila, and a lime on the glass, salt optional. 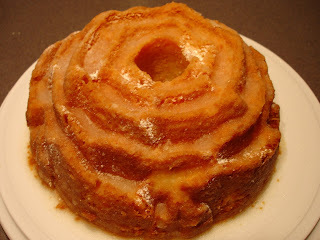 Jenny loves to bake so she brought a cake - Cream Cheese Lime Pound Cake. YUM! The flavor was perfect with all of the Mexican food and I loved the lime crunch on the outside of the cake. Thanks, Jenny!